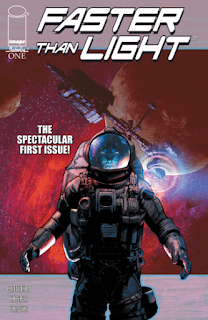 The Fellowship was fortunate enough to obtain a copy of FASTER THAN LIGHT #1 from Image Comics. Brian Haberlin writes and draws, and Geirrod VanDyke colors. Haberlin and Skip Brittenham are the creators. The name of the first faster-than-light spaceship launched from Earth is Discovery. Captain Forest and the crew are under a ton of pressure, from without and within. But whether the ship is ready or not, she launches immediately. There’s something that the public doesn’t know about this – there’s a lot that the public doesn’t know about this mission. But Forest is going to do some discovering really quickly. This issue does a wonderful job of piling problems on these poor characters. I’m not going to spoil any of them, but it’s quite impressive how deeply layered they are. And I’m looking forward to seeing how Fredricks fits in to all of this. The art adds a very serious tone to all of this, too – I especially like the landscape (space-scape) panels. There is simply a ton of story packed into this first issue, and it really gives the book a breathless feel. And tentacles. This is going to be a fun ride, so get on board now. FASTER THAN LIGHT #1 is available now at your FLCS or at imagecomics.com.